The “Down East” Tour and the Cuckoo’s Wine. The first part of 2015 has been so busy, we almost didn’t get around to planning our big summer tour this year. We kicked off the year with as headliners at the South Florida Folk Festival (second year in a row), and spent a rockin’ 4 days in Key West, doing what we do at the Smokin’ Tuna Saloon and Blue Heaven. In addition to the usual round of great festivals– Willfest, Sarasota Folk Festival, and the Florida Folk Festival— we added regular shows at a couple of great venues in our region: the Celtic Ray Irish Pub in Punta Gorda and the Olde Fish House Marina in Matlacha. The Celtic Ray is a wonderfully authentic Irish pub, thanks to Kevin Doyle and family, with terrific food and a wonderful atmosphere. The Olde Fish House is a little piece of old Florida, with a regular crowd of both local fishermen and tourists. We’ve enjoyed playing there on Sunday afternoons and look forward to being back in the fall. They are actually in the process of expanding, so it will be even better when we get back there. 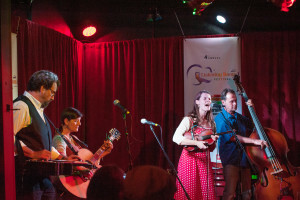 One of the big highlights of the spring was the Listening Room Festival, organized by Fran Snyder and crew from ConcertsInYourHome.com. We were selected as one of the six headlining acts, given the opportunity to participate in the kickoff concert at The Hideaway Cafe, the finale at The Palladium, and a bunch of office and house concerts over the course of the week. We got to play for the mayor on the steps of City Hall in St Pete, at the Ale and the Witch with our friends, Applebutter Express, and at Artworks St. Pete. One of the best parts of the whole thing was getting to hang out back stage with some great musicians from all over the country. In spite of all that, however, we did manage to get our summer tour together, and it will be a doozy. Last year we ended up almost at the Canadian border in Minnesota. This year, we’re headed “down east,” as far as Presque Isle, Maine, with stops all along the way both up and back. We’ll be making a return visit to a few places along the way– High Cove, the Purple Fiddle in West Virginia, Steve’s Live Music in Atlanta– but we’ll also be making our first foray into the big eastern cities. We’ll be at Piano’s in New York City on August 3rd, Aurora in Providence on August 4th, and Obrien’s Pub in Boston on August 7th. We have three shows in Maine, in the middle of the tour. We’ll be doing a concert in the Riverside Bicentennial Park in Presque Isle on August 8, a house concert at Dragonfly Meadow Farm in Limerick, and we’re part of a concert series at Acoustic Artisans (a violin shop!) in Portland, ME. We’re told the smart choice is to return to the same places each year, building up an audience over time. We’re having a little trouble doing that smart thing, however. For us, touring is about getting to play music in a lot of new and interesting places, meeting people, having adventures along the way. We are thinking about it as a way to enrich our music as well. Our current CD project is our first “concept” effort. Traditional folk music is generally all about telling stories, so we are focusing on songs that tell stories about significant moments and passages in life. Our plan is to organize the presentation on the CD much the way we would organize a set list for a live show, and we hope to capture the feel of our live performances in the recording process. We’re imagining the CD as if it were a collection of short stories with some recurring themes. If you think about it, you can probably name a lot of songs that are about life on the road. Most of these songs tend to be a rather self-regarding, however, reflecting the experiences of musicians who spend their time in a kind of tour bus bubble, insulated from the people who come to their shows. The thing about our kind of music, and the places where we play– cafes, the occasional pub, listening rooms, people’s living rooms– is that we aren’t insulated at all. We hardly ever find ourselves separated from the audience by footlights. Folk music happens in the midst of people’s lives. Touring, for us, is about the stories: not just our own story, but the stories we encounter along the way. Here is the whole schedule. 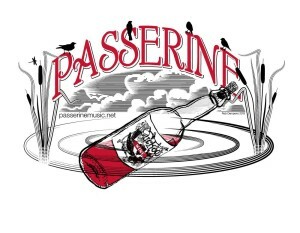 Follow us on Facebook, Instagram (@passerinemusic), or Twitter (@passerine4) for up-to-the-minute reports from the road. 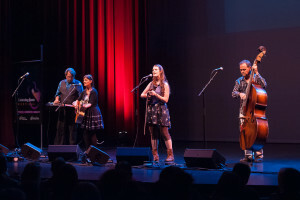 25-Jul, Jack of the Wood, Asheville, NC. 1-Aug, House Concert, Arlington, VA.